Many people, most people in some places, have a negative feeling towards 4×4 vehicles. They’re big, heavy, inefficient, and plain stupid when driven in the city which is very often the case. Londoners call them Chelsea tractors, but happily not all 4x4s deserve harsh critics. 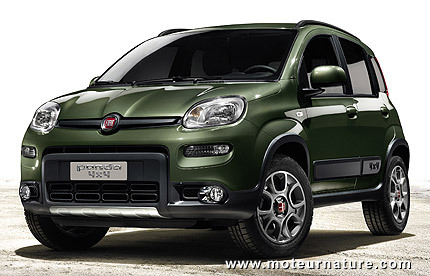 There is a new one that small and light, it’s the Fiat Panda. Its dry weight is only 2315 lbs (1050 kg), so it’s more than one ton less than the average American SUV. Its engine is tiny two cylinder 0.9-liter unit, generating 84-hp with the help of a turbocharger. With a 6-speed manual transmission, performance is only adequate, but fuel economy is great, and more like of a compact than the average SUV. Some people may question the off-road abilities of this little car, but the video below will prove them that the Fiat Panda can handle many difficulties without losing its aplomb.